The Daily Advocate’s spring sports athletes of the year are Greenville boys track and field athlete Aaron Balsbaugh and Greenville softball player Ally Russell. 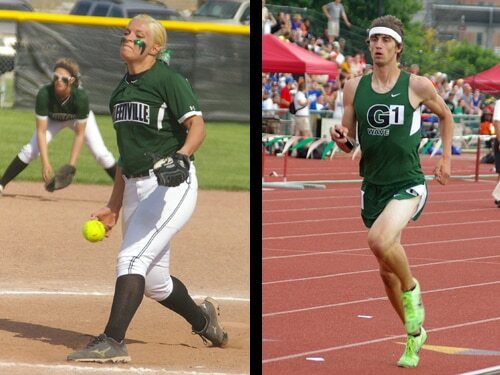 DARKE COUNTY – A pair of senior athletes who will go down as two of the best in Greenville High School history are The Daily Advocate’s spring sports athletes of the year. Balsbaugh qualified for state for a second consecutive season as a senior. After making it to Columbus in the 800 meters as a junior, he helped lead the Green Wave’s 4×800 meter relay team to state as a senior. He and his Green Wave teammates finished 14th in the Division I 4×800 relay. Balsbaugh qualified for the regional tournament in four events as a senior – the 4×400 meter relay, the 4×800 relay, the 800 meter run and the high jump. The Greenville senior led all Darke County athletes in the 400 meter dash at 52.33, in the 800 meter run in 1:55.64, in the 1,600 meter run this year at 4:27.13 and in the high jump at 6 feet 4 inches. She was named first team all-GWOC by the conference, the GWOC North softball player of the year by the conference, first team all-Ohio by the OHSFSCA, first team all-North Region by the National Fastpitch Coaches Association, second team all-America by the NFCA and was named to the Ohio All Stars softball team that competed against the USA Junior Women’s National Team.